"Because our brains can no longer think beyond a tweet, we can't write well." from a PW article, "Books Without Batteries: The Negative Impacts of Technology," by Bill Henderson, April 11, 2011. And be honest now. Would you be a better, stronger writer if the internet didn't exist? Or is Bill Henderson wrong? Has blogging and tweeting actually IMPROVED your writing? 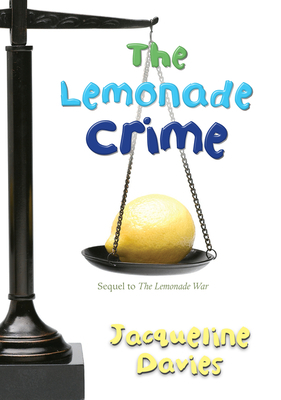 The Lemonade Crime by Jacqueline Davies (Houghton Mifflin, April 2011, for ages 8 to 12). This engaging sequel to The Lemonade War was inspired by questions fans asked Davies after the first book. What about Scott Spencer? Did he or didn't he steal the $208 that Evan and Jessie earned from selling lemonade? Note that it's probably best to read The Lemonade War first, although Davies is careful to restate the core of that story without overwhelming the reader with information. It's now September and the start of 4th grade. Because Jessie has skipped a grade, she and her older brother Evan are in the same class. Evan has a lot of friends but Jessie is quiet and mostly stays by herself at recess. Until Scott Spencer starts bragging about the new XBox 20/20 that he bought with his own money. Jessie is furious. She's convinced he stole that money from Evan when they were swimming in the summer. Jessie plunges into research with her usual dedication. Evan wishes she would just forget the whole thing. But Jessie serves Scott with a hand-lettered warrant for his arrest, and arranges a "trial" after school one Friday. The definitions of legal terms such as circumstantial evidence, eyewitness, and due diligence are given in brief chapter headings, but the reader will learn more by reading the story and seeing it all unfold. Fascinating stuff for kids who like whodunits or detective stories, this book also explores sibling relationships and the importance of telling the truth. In addition, the ending may surprise you! This book should appeal to fans of Andrew Clements or Barbara O'Connor. Marvelous Middle Grade Monday is the brainchild of Shannon Whitney Messenger. Go see what she's up to here. What marvelous middle grade novels have YOU read this month? There are plenty of childrens' books about the environment. 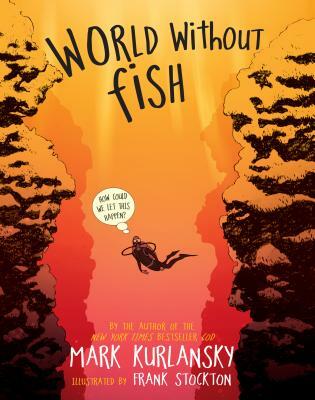 One of the most interesting new ones is WORLD WITHOUT FISH by Mark Kurlansky (Workman Publishing, April 2011). Part graphic novel, part history, part science, with section headings in a very large kid-friendly font, and lots of full-color illustrations throughout, this should appeal to today's internet-savvy readers. Kurlansky touches on global warming, pollution, and overfishing as the three main culprits in why the coral reefs are dying. He offers practical suggestions that kids themselves can follow. A fun and painless way to learn. "Here's what an e-reader is: a battery-operated slab... one-half inch thick, perhaps with an aluminum border, rubberized back, plastic, metal, silicon, a bit of gold, plus rare metals such as columbite-tantalite (Google it) ripped from the earth, often in war-torn Africa. To make one e-reader requires 33 pounds of minerals, plus 79 gallons of water to refine the minerals and produce the battery and printed writing." "Then you figure that the 100 million e-readers will be outmoded in short order, to be replaced by 100 million new and improved devices." "Here's what it takes to make a book, which... will be shared by many readers and preserved and appreciated... recycled paper, a dash of minerals, and two gallons of water. Batteries not necessary. If trees are harvested, they can be replanted." All of the above quotes are from a PW article, "Books Without Batteries: The Negative Impacts of Technology," by Bill Henderson, April 11, 2011. Henderson was summarizing a New York Times article from April 4, 2011. According to that article, "OP CHART: How Green is My I-Pad," by Daniel Goleman and Gregory Norris, "The adverse health impacts [on the general public] from making one e-reader are estimated to be 70 times greater than those for making a single book." Still enjoy your e-reader? Do you agree or disagree that e-readers are actually worse for the environment? 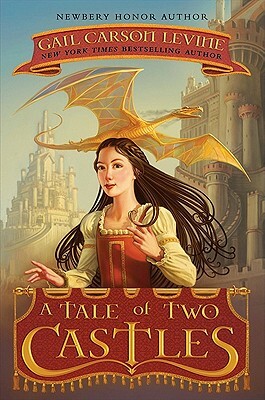 A Tale of Two Castles by Gail Carson Levine (coming May 10, 2011 from HarperCollins, for ages 8 to 12). Elodie (commonly known as Lodie) wants more than anything to be a mansioner, to act in a traveling group of actors who take their colorful wooden sets, or mansions, with them as they travel. But although she's twelve and old enough to apprentice, her poor farming parents don't have the money. She travels to the town of Two Castles by ferry, hoping to secure a free ten-year apprenticeship. She learns from Goodwife Celeste, who is also traveling to Two Castles, that free apprenticeships have been abolished. What's Lodie to do? Could she handle assisting the mysterious dragon, Meenore, who sells toasted bread and cheese in the market square and also tries to solve mysteries? Would she be willing to work for the misunderstood ogre who lives in one of the castles? Or to serve greedy King Grenville and his flighty daughter who live in the other? It's a joy to read a novel written by an author at the top of her form. This is as much fun as Ella Enchanted. You will fall in love with the smart and impulsive Elodie, with the medieval fantasy world Gail Carson Levine has created, and with some of the creatures who inhabit Two Castles. The medieval detective work is fascinating. Elodie learns to hone her talent for observation (which any good mansioner must have) and also to use the new skills of inductive and deductive reasoning. The novel is rich in sensory detail. You'll want to eat an apple as badly as Lodie does when she first arrives in Two Castles, starving and alone. You'll shiver along with her when she's cold, and be warmed when she is. And you'll be just as intrigued by the mystery of the missing dog and the mystery of who is conspiring against Count Jonty Um, the ogre. The publisher suggests this is for ages 8 to 12, but some younger readers may be a bit confused by the large cast of characters and the sophisticated language (although Levine is careful to explain phrases like "whited sepulchre"). I think I would have adored this book at the age of 9 or 10. Marvelous Middle Grade Monday in the brainchild of Shannon Whitney Messenger. Go see what she has up her sleeve today. What marvelous books have you read recently? Marvelous Middle Grade Monday -- How Moving! Hey everyone, so sorry I won't be here Monday to respond to comments or read all of your blogs. I'm writing this two days ahead of time and scheduling it to post first thing Monday morning (Ha! Hope it works!). I've been a terrible follower recently and I apologize. But I really have been busy. My parents are moving. For the last few weeks, we've been sorting out and sifting through decades' worth of accumulated belongings (lesson: don't be a pack rat!). Looking through this stuff has been a real trip for me, having lived in that house from the time I was nine years old until I went off to college. My baby shoes. Halloween costumes. Letters I wrote from college. My parents never threw away anything. Now they're downsizing, so it all has to go. I realized there are quite a few middle grade novels in which the main character moves. I've already featured three of them on this blog. Today I'll include a fourth which I read a few months ago and never talked about. 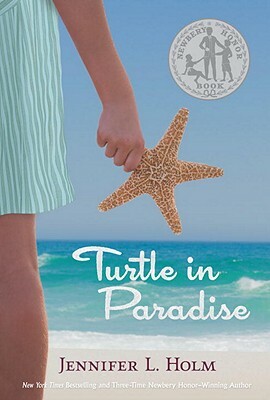 1) Turtle in Paradise by Jennifer Holm (Random House, May 2010, ages 8 to 12). Won a Newbery Honor in January. Moving doesn't bother eleven-year-old Turtle at all. It's 1935; times are tough and people do what they have to. Mama has a new job as a live-in housekeeper for a rich woman who can't abide children, so Turtle gets sent all the way from New Jersey to the Florida Keys to stay with an aunt she's never met. In Key West, Turtle hangs out with her three rambunctious boy cousins and their friend, and follows them around as they run their babysitting service. The weather is always hot and sticky and no one wears shoes. There's never enough money. But somehow these kids manage to have plenty of fun. The novel is ripe with 1930s flavor, including door-to-door salesmen, get-rich-quick schemes, references to Little Orphan Annie and Shirley Temple. And there's even an exciting search for buried treasure! The best thing about this colorful story is the voice. Turtle narrates and she's smart, tough, cynical, and observant. Chapter One is called "Rotten Kids." And that's how Turtle feels about her peers. Here's the opening line to chapter 14: "It's a fact: if a kid is being nice, he's probably up to no good." The aptly-named Turtle has spent her life building a shell around herself, but while living with her Florida relatives she begins to crawl out from under that shell. Moving may turn out to be the best thing that's happened to Turtle in a long time. This is based on a story from the author's own family and you can tell a lot of love went into creating the tale. 2) Moon Over Manifest by Clare Vanderpool (Delacorte Press, Oct 2010, for ages 9 to 12). Abilene moves to the Kansas town where her father grew up and gradually learns some secrets about the townspeople. Here's my review from last September. 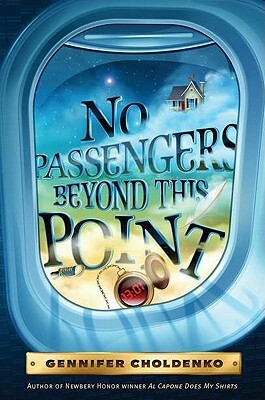 3) No Passengers Beyond This Point by Gennifer Choldenko (Dial Books for Young Readers, Feb 2011, ages 9 to 12). Finn and his two sisters have to move to Colorado to stay with Uncle Red. But the plane lands in an altogether different world! I raved about this last December. 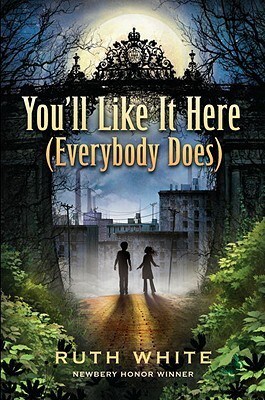 4) You'll Like It Here (Everybody Does) by Ruth White (Delacorte Press, coming June 14, 2011, for ages 9 to 12). Meggie and her family have to move incredibly far away! I talked about this just last week. What middle grade novels about moving have I missed? And which one is your favorite? Marvelous Middle Grade Monday is the brainchild of Shannon Whitney Messenger. Go see what she's up to today. Welcome to another post in an occasional series in which a bookseller (that would be me) rants about the biz. Picture books make great baby gifts. Yes, you knew that already. Duh. That's one of the reasons you publish them. But did you know that the hot new custom at baby showers is for everyone who attends the shower to bring a favorite book from their own childhood? The Wonderful World of Aunt Tuddy, written by Jeremy Gury and illustrated by Hilary Knight (Random House, 1958). I can still quote from this book. Yes, I'm old. Deal with it. 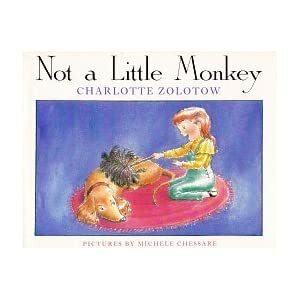 Not a Little Monkey, written by Charlotte Zolotow, illustrated by Roger Duvoisin (Lothrop, 1957), for which I can't find an image (even on Charlotte's own website) except for this inferior 1989 reissue with a different illustrator. The Busy Man and the Night-time Noises, which I believe was written by Vana Earl around 1954 and I can find no image at all. These books? Out of print. Almost impossible to find or far too expensive on used book sites. Could there be a market for inexpensive reissued editions of picture books (maybe even board book versions) from, oh, the baby boomer years? So, everyone else, what was YOUR favorite childhood picture book? And is it still in print? Thanks to everyone who entered my giveaway for two ARCS of DIVERGENT by Veronica Roth (coming in May from Harper, for ages 14 and up). And my deepest apologies for not making it clear that the contest closed at 11:59 pm EASTERN US TIME and for neglecting to schedule my post to automatically turn off comments at that moment. Heh heh (*blushes deeply*). I'm still learning how Blogger works. For instance, I just learned you can write a post ahead of time and then SCHEDULE it to appear at a later date. Duh! What did I think that "post option" thingie was for??? I have no idea. Clearly, I'm Clueless. That should be a faction in DIVERGENT. For those of you who entered too late, don't despair. Other contests are in the works, I promise. Plus, you only have less than a month now to wait for the hardcover of DIVERGENT to go on sale. And this is a book you'll want to buy. Trust me. And now to announce the winners. And I'm serious, people, she made a youtube video, with clips from Charlie Chaplin's "Modern Times," just to enter this giveaway. I'm honored. Go pop some popcorn and settle down to watch it, because it's 6 minutes long! Here's the link. Congrats to you both! Check your email for a message from me asking for your address. And really, congrats and heartfelt thanks to all of you who entered. You're all original and creative in my book! Okay, I know this book doesn't come out until June, but I just finished reading it and adored it, so I wanted to tell you about it while it's fresh in my mind. You'll Like It Here (Everybody Does) by Ruth White (Delacorte Press, coming June 14, 2011, for ages 9 to 12). Meggie is eleven years old, almost twelve. She lives in rural North Carolina with her older brother David, their widowed mother, and Gramps. Meggie and her family are average people. The kids do well in school and have friends. Mom is a teacher. Gramps is an artist, which explains the occasional splatter of blue paint in his hair. But something strange is happening in their peaceful town. Rumors are swirling: there are aliens among us! Meggie still has nightmares from similar rumors when they lived in California. Now it's happening here. Aliens? Here on Earth? Could it be? When scary creatures come after them, Meggie and her family have to escape in the middle of the night. They find themselves in an unusual city. It's clean, safe, and happy. People never seem to get upset about anything. And everyone tells Meggie and her family, "You'll like it here. Everybody does." Ha! Rest assured that things are not what they seem! To tell you more would be to spoil the plot of this fun and quirky story. I think it's safe to say you'll recognize some nods to Homer's Odyssey as well as "The Twilight Zone" (although today's kids might not) and some classics of children's lit, like The Wizard of Oz. There are also homages to famous political leaders, singers, and artists. You can just tell Ruth White had a blast writing this. And if her name sounds familiar, she's the author of the Newbery-honor winning Belle Prater's Boy and other books. But here she takes on science fiction and it rocks! This even reminded me a little bit of No Passengers Beyond This Point, which I reviewed here. You'll Like It Here (Everybody Does) is the perfect summer read. It'll whisk you away to another world just as a twist reveals something surprising. And although there's plenty of food for thought here, the pace is lightning-fast (I read this in one day). In fact, the opening sentence is such a shocker, it'll grab you and pull you in. Meggie tells most of the story in the present tense and she's a wonderful character, with realistic problems, including being teased by her brother. You'll find yourself sympathizing with Meggie from the first page. A few chapters are narrated by David, whose voice is totally different. The growing, changing relationship between the siblings is one of the most impressive parts of this novel. Pick up You'll Like It Here (Everybody Does) and have a blast! Marvelous Middle Grade Monday is the brainchild of Shannon Whitney Messenger. Go HERE to see what she's reviewing today. UPDATE: Deb Marshall joins in with this post including a giveaway! What marvels of children's lit have YOU read this week? You still have a little over one day to enter my ARC giveaway! 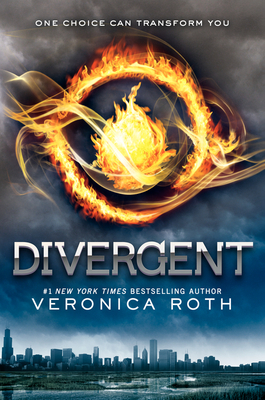 I'm giving away two ARCs of DIVERGENT by Veronica Roth. Open internationally. Giveaway closes Sunday April 3 at 11:59 EDT. Two winners to be announced no later than Wed April 6. Important: You MUST go to this post for details and to enter.